Fair Game is a 2010 biographical political drama film directed by Doug Liman and starring Naomi Watts and Sean Penn. It is based on Valerie Plame's memoir, Fair Game, and Joseph C. Wilson's memoir, The Politics of Truth. Watts stars as Plame and Penn as her husband, Joseph C. Wilson. It was released in 2010 and was one of the official selections competing for the Palme d'Or at the 2010 Cannes Film Festival. The film won the "Freedom of Expression Award" from the National Board of Review. The film marked Watts' and Penn's third collaboration, having previously co-starred in the films 21 Grams and The Assassination of Richard Nixon. Nicole Kidman and Russell Crowe were originally cast in the lead roles in 2008. Production took place in Washington, D.C. and New York City. In October 2009 the film news website Corona's Coming Attractions published an exclusive review from a source that had been invited to a test screening of the film. The reviewer gave the rough cut a positive recommendation calling it, "A wonderful human drama with political suspense that should interest anybody no matter how they vote." The film had a public screening during the Abu Dhabi film festival on October 21, 2010 and it got a generally positive review. There was also a Q&A session with the director afterwards. There was a second preview screening in Brisbane, Australia as part of the Brisbane International Film Festival (BIFF) on October 28, 2010. Fair Game received positive reviews. Review aggregate Rotten Tomatoes reports a 79%, "fresh" accumulated critical reaction. There has been dispute as to the historical accuracy of Fair Game. Two claims in the film caused vastly differing responses among political analysts. The first is that Joe Wilson's fact-finding trip to Niger served to debunk a British claim that Saddam Hussein had earlier tried to obtain uranium from Niger. In a November 2010 Washington Post column about the film, Walter Pincus and Richard Leiby, two reporters who had covered the Plame affair, wrote that this characterization was accurate. In National Review, journalist Clifford May disagreed, writing that, rather than debunking the uranium claim, Wilson's trip and report had actually bolstered it, because "the most important piece of information Wilson brought back from his mission to Africa was that a high-level Iraqi trade mission had visited Niger in 1999." A December 2010 Washington Post editorial also disagreed with Pincus and Leiby, citing the 2004 British Butler Review, which stated that the original claim by the British government was accurate. In response, journalist David Corn, writing in Mother Jones, wrote that, contrary to the Butler Review, the CIA had stated in a private memo that the British uranium claim had been an exaggeration. The film also explains that Niger's main uranium mine is operated by Cogema, "a French company jointly controlled by the Japanese and Germans". In fact Cogema, now a subsidiary of Areva, is a French parastatal company and uranium extraction in Niger was exclusively controlled by French interests until 2006, when bids for exploration permits were opened to some foreign companies led by other interests. The second controversial allegation in the film was the suggestion that Plame's name had been leaked to the press, and specifically to Robert Novak, by someone in the White House, as retribution for Wilson's critical public comments about the uranium claim. The Washington Post editorial and May both stated that the source for the leak was instead State Department official Richard Armitage, who was himself an opponent of the Iraq War and thus would have no reason to try to discredit Wilson. (Armitage is not mentioned in Fair Game, other than in a text script at the end of the film.) Pincus and Leiby, on the other hand, called this portion of the film accurate. Corn agreed, writing that, though Armitage had been a source for the leak, he may not have been the only source, and that Karl Rove may have also leaked the information. Rove had in fact confirmed Plame's identity to Novak, but only after Novak had already heard the information from another source. Rove had also mentioned Plame, though not by name, to another reporter, Time Magazine's Matthew Cooper, although Cooper did not publish this information before Novak's revelation. There was more consensus about other aspects of Fair Game. In the film, Valerie Plame is shown working closely, and covertly, with a group of Iraqi scientists until her cover is blown; it is implied that the scientists were then abandoned as a result. Pincus and Leiby, May and the Washington Post editorial all agreed that Plame never worked directly with the scientists, and that the program did not end when her name was revealed. Pincus and Leiby also took issue with the film's depiction of Plame and Wilson's appearance in a profile in Vanity Fair magazine after Plame's outing – the two are shown in the film agonizing over whether to appear in the profile, but it is not shown that their decision to appear in a fashion-style photograph alongside the profile ended up becoming, in Pincus and Leiby's words, "a PR debacle for them." On the other hand, Pincus and Leiby praised the film for accuracy on several other points, including the indication that Plame had been a covert operative at the time of her outing (some reports indicated that she was not), and that, contrary to the original Novak column, Wilson had not been chosen to go on the Niger fact-finding trip due to a recommendation from his wife. 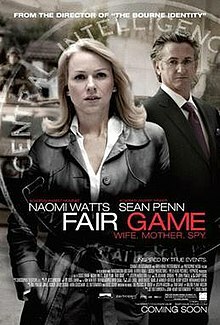 Fair Game was released on DVD and Blu-ray for Region 1/Region A on March 29, 2011, and for Region 2/Region B on July 11, 2011. A director's cut of the film was released on Netflix in 2018, running six minutes longer. ^ "Fair Game (2010) (2010) – Box Office Mojo". Box Office Mojo. Retrieved November 14, 2010. ^ a b c Michael Fleming (February 23, 2009). "Sean Penn in talks for Plame 'Game'". Variety. Retrieved May 30, 2009. ^ "Hollywood Reporter: Cannes Lineup". The Hollywood Reporter. ^ "Nicole Kidman Outed As Valerie Plame". Huffington Post. February 14, 2008. ^ "Fair Game Reviews, Pictures". Rotten Tomatoes. Retrieved July 20, 2011. ^ a b c d e Pincus, Walter; Leiby, Richard (November 7, 2010). "'Fair Game' gets some things about the Valerie Plame case right, some wrong". The Washington Post. ^ a b c "Hollywood myth-making on Valerie Plame controversy". The Washington Post. December 4, 2010. Retrieved December 4, 2010. ^ "Washington Post: Still Spinning the CIA Leak Case". Mother Jones. Retrieved December 22, 2010. This page was last edited on 24 March 2019, at 12:05 (UTC).